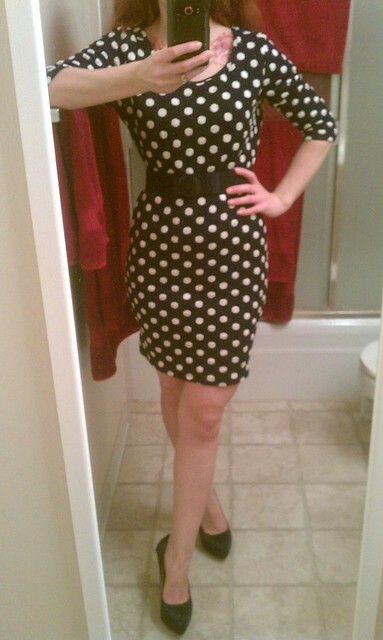 Nasty Gal polka dot dress. 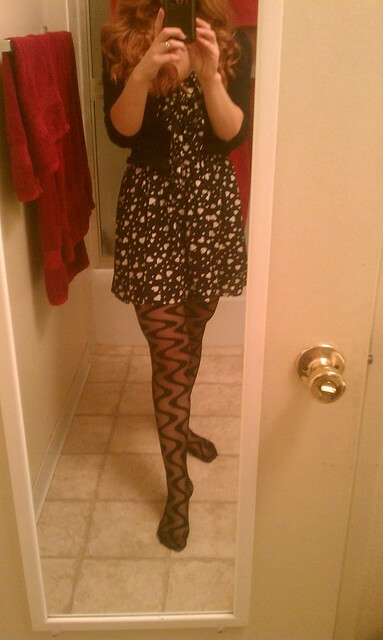 I cinched the waist with an elastic belt. 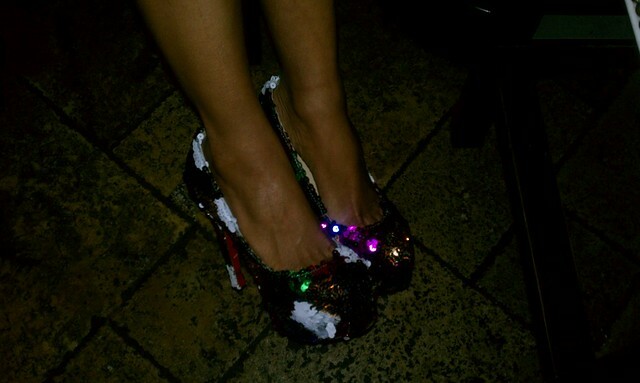 Killer Glitter shoes!!! When I saw these I fell in love!!! Check out this sugary editorial entitled “Let Them Eat Cake” I found via Models.com. I love the pastel coloring in this and pastels are sooo in this year! The props, background and lighting is amazing! 2. 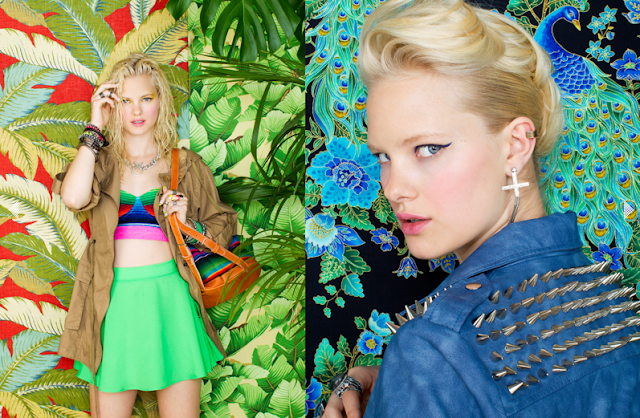 Nasty Gal has a Rockin’ Look Book this season!! 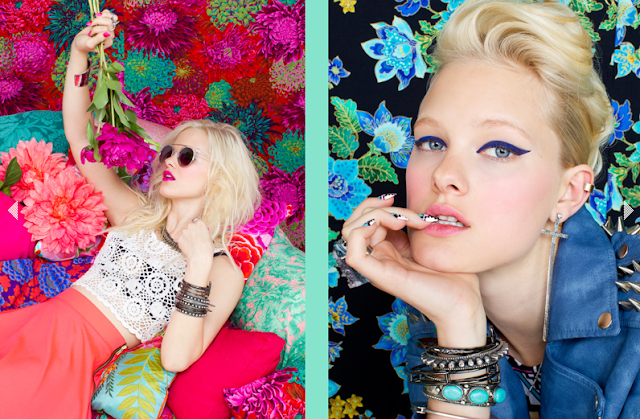 Check out Nasty Gal’s colorful rocker look book full of brights and studs!! My obsession with studding continues. I hope to get my very own stud kit soon so I can create some studded pieces myself!! I saw this awesome DIY hair style via A Cup Of JO that I totally want to try! Make sure you follow me on Pinterest for more DIY Hair Styles and to see what else I’m crushing on from the world wide web. Click here. 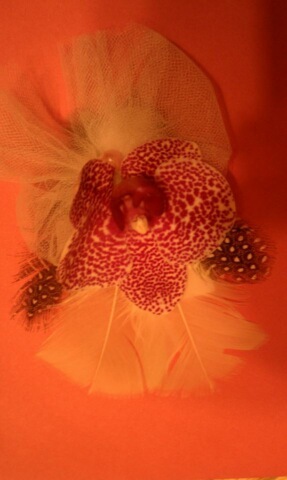 Since my orchid is beautifully blooming right now, I came up with a way to utilize them for mothers day. First I sewed some feathers on to a piece of ribbon. Then I tied some tulle in a bow and secured it with a pink pearl using my needle and thread. Then when I picked the flower I secured it in the center with a pearl headed pin. Last month 14 designers showcased their designs in 3 days. As I mentioned in my previous post, I assisted the producer of the showcase coordinating and fitting models, assisting designers, working with makeup and hair provided by Toni&Guy, and styling a few runway looks. All three days were electric! You could feel the excitement in the air. We even had some title winners in the runway line up: Alexa Jones – Miss California Teen USA, Morgan Berschauer – Miss Laguna Hills Teen, Susan Romanishin – Miss Orange County USA, and Tiffany Brock – Miss Orange County Teen Regional USA. First in the line up for night one was Bold Girlz, a clothing company who’s mission is to empower girls. 10% of their proceeds go towards charities benefiting young women. Next was Confiance (French for Confidence), a t-shirt and jewelry collection by Maryam Gueramian. BritBoy Fashions took the stage next. I assisted both the designer, Brian Terry, and Parris Harris in styling for this line. Closing out the night, we had Borreca Brasil Swimwear by Daniella Rosa. First up was Purple Reign Apparel, a motor cycle inspired brand with a bold statement. I assisted the designer, Brian Peters, in styling his line up. Second was Bine & Bas, featuring some sharp and stylish button down shirts. Next up was BritBoy Fashions, this time showcasing dresses. Closing we had Laili Lau who had some gorgeous drapey pieces that definitely stood out from the rest and was a perfect way to close the night. Day 3 was Earth Day so we had L.E.A.F. present Eco fashion in “L.E.A.F. Rocks Eco Fashion”, a Earth Day Celebration featuring Eco fashions by Volcom, Element, Quiksilver, Roxy, Rip Curl and Dog Town. 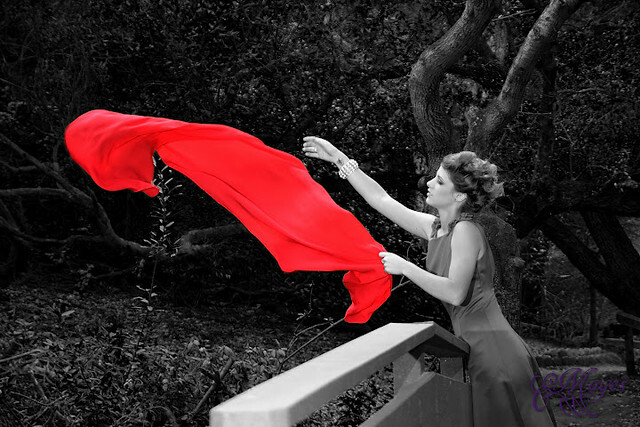 The organization empowers youth to be the leaders of the environment through film, music, eco fashion, and technology. Next was the Hodges Collection, designed by the OC Fashion Showcase’s Founder, Deanna Hodges. Her line of comfortably chic women’s wear was absolutely stunning! 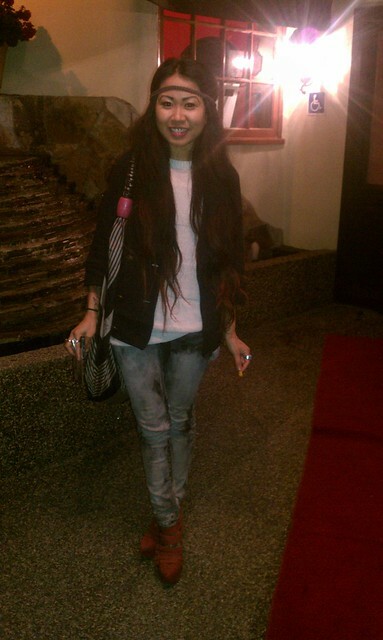 The rest of the night included BritBoy Fashions, M Fashions, Pink Weave, Jammu Style, and David Klein. And there you have it folks! I had such a blast working with all the wonderful people in the OC Fashion Showcase! I can’t wait for next season!!! Keep an eye on this team, we can expect this showcase to keep growing and promoting fashion week right here in Orange County! Be sure to subscribe to my blog! Once upon a time… there was a fashion stylist who gathered together the fairest models in all the land, dressed them, and stole them away to an enchanted forest where the lenses of a multitude of cameras captured their beauty. 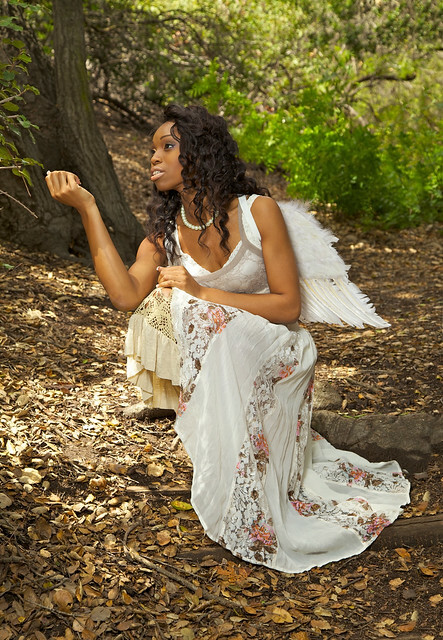 I had an amazing opportunity to style 7 models for a group of photographers at the beautiful Oak Canyon Nature Center in Anaheim Hills. I provided the wardrobe and accessories and worked with the hair and makeup crew to complete the looks. I have enticed the photographers to submit their photos to me in hopes of winning the #1 Photo of the Day, judged by yours truly. I received over 100 enchanting photos from various photographers and it was extremely hard to choose but I kept coming back to this one photo that stole my heart. I think this photo embodies the theme of the shoot, the lighting is soft and strategically placed, and it perfectly displays the rose detail on this backless dress. I love the angle and the pose. This looks like something out of a luxury magazine with an enchanted forest as the setting. Check out some of the other photos submitted by 135FotoGrafiks. I’d also like to recognize a few photos that are aslo amazing! Anyone who has ever modeled before knows how hard it is to get a shot like this. 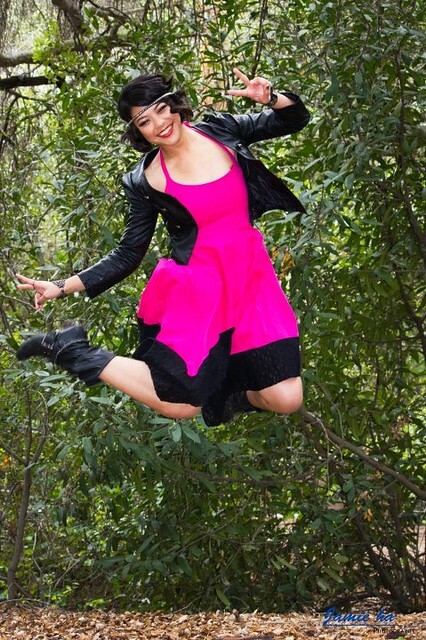 It takes being able to jump high and control your body and facial expression, it’s not as easy as it looks so GREAT JOB ROSANNARA CHUNN! To see the rest of the photos from the Enchanted Forest shoot please head over to my set on flickr by clicking ===> here. Thank you to everyone who worked so hard on this shoot, there are some really amazing photos from it. I wish I could display all of my favorite ones on here but there simply isn’t enough time in the day. P.S. Who’s going to the Renaissance Faire this season? Only 3 weekends left. 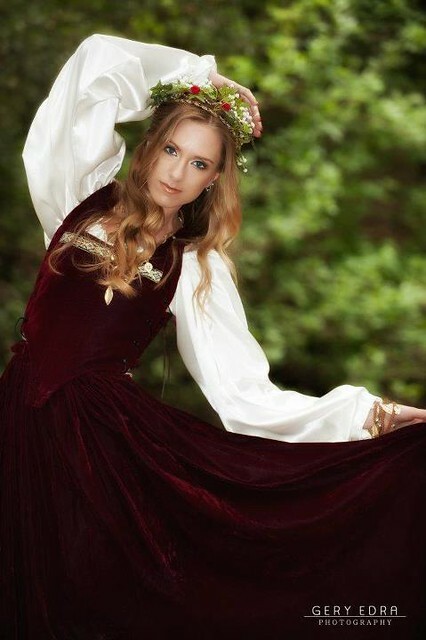 Briana July beautifully modeled the dress I usually wear to the Faire, custom made by Majestic Velvets. P.S.S If I forgot to mention anyone or miscredited anyone’s photos please send me a message using the “contact me” tab at the top. P.S.S.S….. Be sure to subscribe to my blog and never miss a post! Enter your email address and then check your email to confirm subscription.